I never thought I’d be grateful to Maxx Maxwell. She sure made a bad impression on me the first time we met. I was sitting in my office—I was still a cop back then—when the desk clerk buzzed to say somebody wanted to see me about a suicide case the week before. Some crazy guitar player named Jimmy Nashville decided to jump out his window. Problem was he lived on the ninth floor. I say “crazy guitar player” because that’s what I thought then. I don’t see things that way anymore. But we’ll get to that. So anyway I went out front to see what was going on. As soon as she opened her mouth I recognized her, her voice anyway. Because she’d been pestering me on the phone. Saw an article in the Times quoting us as saying the death wasn’t being investigated as a homicide and she wanted to know why not. In that first phone conversation, I told her there was no evidence of foul play, which was completely true. When people are pushed out a window they usually land closer to the building than when they jump. This guy did land pretty close to his building, but there was no sign of a fight in his apartment—no furniture knocked around or anything like that. She told me he was in her band, a blues band, and he would never kill himself before a gig. Apparently she found out he was dead when she came to pick him to go play down in the Village. She thought he had been murdered, said some big guy had been following him around hassling him. You can probably guess how cops feel when people try to solve their cases for them. I told her she could check back with me when we got the autopsy report—basically just to get rid of her. But a couple of days later there she was on the phone again. The autopsy report wasn’t in, but now she wanted to know if the crime scene tape was still up. I reminded her that as far as we were concerned, there hadn’t been a homicide. So she asked if it was OK if she went inside the apartment. I asked if she had a key. She said, “No, but I’ll think of something” and then she hung up on me. So now she was standing in front of me, with a mop of blond hair and wearing cut-off jeans and a halter top. Somewhere in her thirties—and good-looking, I had to admit. A little skinny but shaped nice where it counts. It didn’t seem like she was going to leave until she said what she came to say, so I led her back to my office. She trailed along telling me that she thought she found something important in the apartment, so I made a crack about saving it till I was sitting down because I couldn’t take much excitement anymore and wanted to survive till I retired, which was coming right up. I had mixed feelings about retirement, like anybody. But now I’ve got a whole new career, thanks to her. When we got to my office, I felt bad for her because she was shivering. We don’t sit around in cutoffs and halter tops all day so I guess maybe the AC was turned up a little high. She pulled a guitar pick out of the pocket of the cutoffs. It seems Jimmy Nashville didn’t use a pick when he played guitar, so finding this pick in his apartment had convinced her she knew who his killer was. Not the big guy who was following him around, but someone else. And it seems the amplifier in Jimmy Nashville’s apartment was turned way up—loud. That fit with her theory about who killed him—the guy who had the guitar-player job in her band before Jimmy got it. It seems she fired the first guy and gave his job to Jimmy. I guess that could be a motive for murder, at least if you read a lot of detective fiction, which I don’t. I listened politely, like we’re supposed to. After all, the public pays our salary. But I hustled her out of there as fast as I could, and I thought that was the end of it. But it wasn’t. A couple of days later, she was back again, pestering me about the autopsy results. Well, they were in, and they made it even more obvious that he’d gone out the window on his own—no signs that he struggled with anybody, no skin under his fingernails or anything like that. 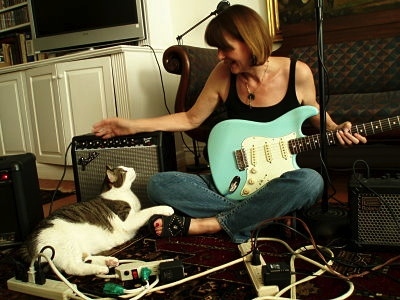 She looked pretty dejected on her way out, and it dawned on me that it must be hard to have your guitar player die. So I asked if she was keeping the band going. Just to be polite. Like I said, the public pays our salary. But maybe there was another reason too. I found myself telling her, even though I didn’t plan to, that a long long time before I became a cop, I used to play the drums. Never thought I’d do it again in this lifetime, but one thing led to another . . . and thanks to Maxx Maxwell I have a new career in retirement. I’m a drummer again, in her band. They call me “Big Walt” Stallings. And she turned out to be a pretty good detective. Peggy Ehrhart is the author of the Maxx Maxwell mystery series. In the first book, Sweet Man Is Gone, Maxx (real name: Elizabeth) solved the puzzle surrounding the death of her guitar player, Jimmy Nashville. 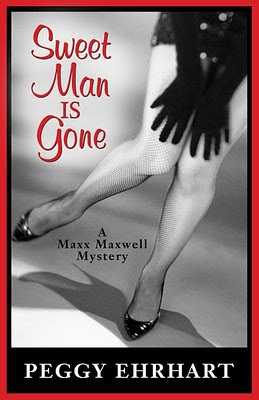 Sweet Man Is Gone came out in hardcover from Five Star/Gale/Cengage in 2008 and is now available on Kindle and Nook, from the Apple iBookstore, and in other ebook formats. The sequel, Got No Friend Anyhow, appeared in January 2011. Maxx is also featured in Murder Gets the Blues, a collection of three music-themed stories available on Kindle. I hope to hear your band play one of these days! What a great second career. I hope you help out with the sleuthing! Something tells me this was meant to be! Hope you make beautiful music together. Sounds like a good combo -- making music and fighting crime -- together. Isn't this how romances sometimes start?